The folks putting out the party-at-the-end-of-the-world racer MotorStorm: Apocalypse revealed another course with six new screenshots today. They vow that "Skyline" is winnable by all 16 vehicle classes. I'm sure I'll go nuts figuring out how for six of them. 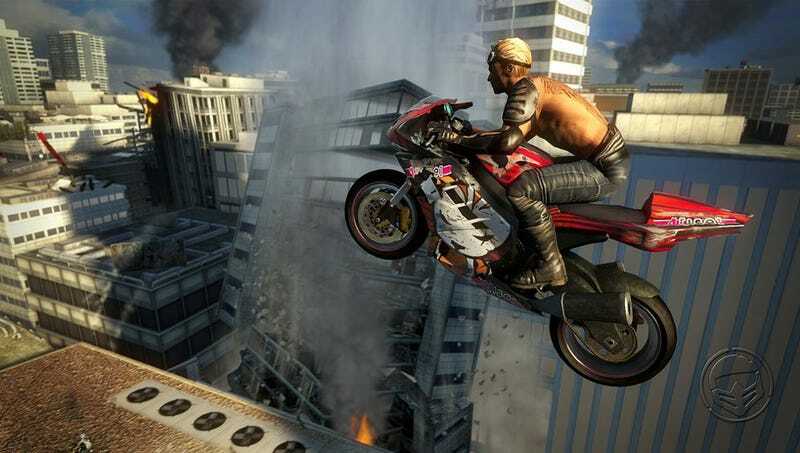 Billed as "‘the one with a race where you get dropped from a helicopter onto a skyscraper that is already collapsing, and are expected to win against a pack of bikes and ATVs on rooftops and in offices that are falling to pieces," Skyline will allow for in-air cooling (in place of water-aided engine cooling). Release the accelerator to take in some fresh air and earn more boost. MotorStorm: Apocalypse is due in February.